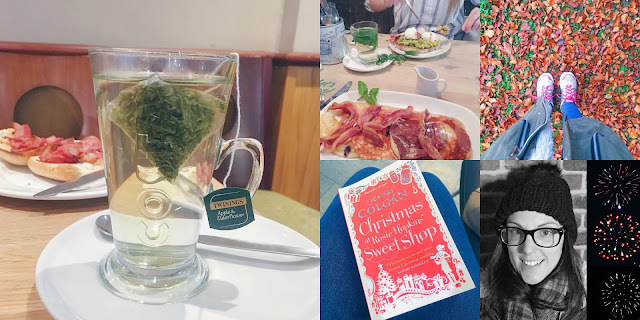 I need to apologise for the lateness of this post. I had hoped to get it up either at the end of December or the first few days of January, but it didn’t happen. So I hope you’ll still enjoy reading through it now. I’ve done this post for a few years now, and always enjoy reflecting on the last year. 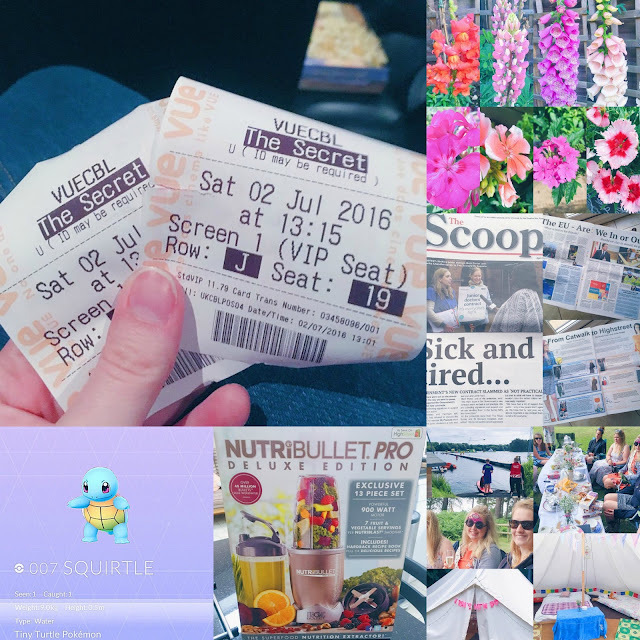 2016 was a year of intense highs and devastating lows, but sorting through all my photos helps me to see that, despite the difficult times, there have been so many happy times too. 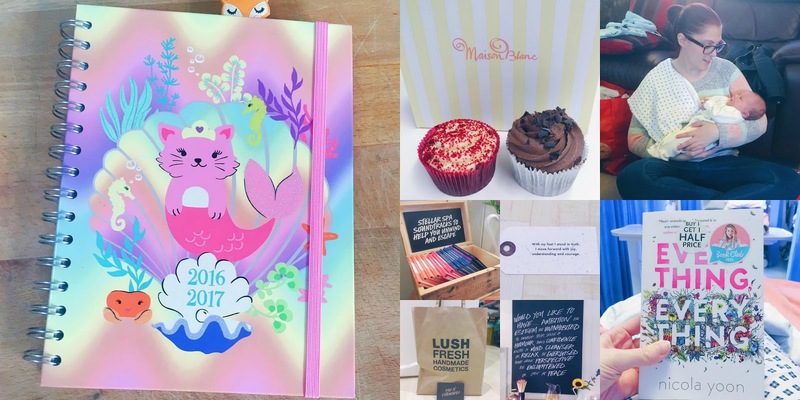 Enjoy browsing through my 2016, and here’s to an awesome 2017! In January I opened my Happy Jar from 2015 – I added more Disney DVDs to my collection – I met my friend, Becky, for a Costa – I bought the Calm book – And I filled up my Pandora bracelet. 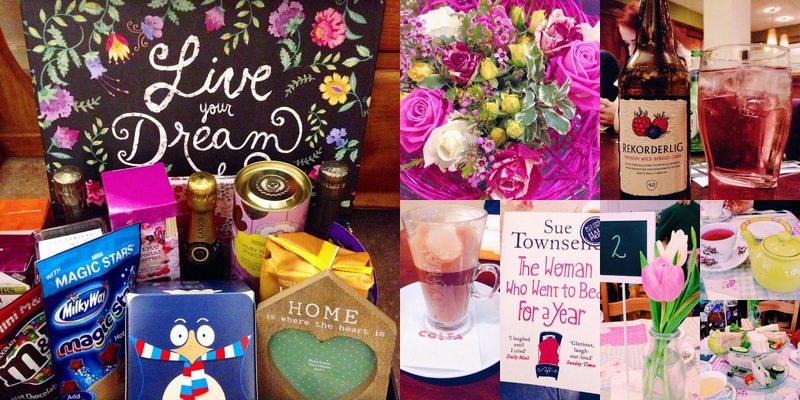 Also in January, David and Emma moved into their first home together and I made this hamper for them – I received some beautiful flowers in the post from my friend Clare – We celebrated Richard and Emma’s birthdays – I saw the POTS specialist for the first time – And David and Emma took me out for afternoon tea. 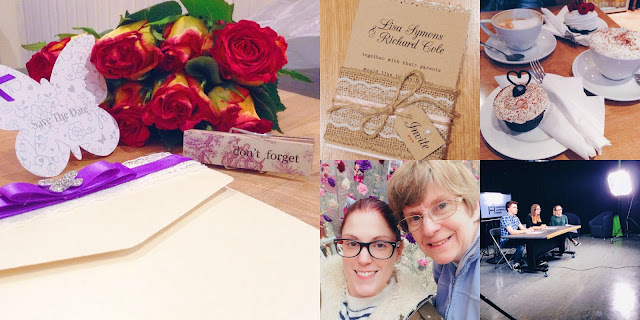 In February I received my invite to David and Emma’s wedding – I also received my invite to Richard and Lisa’s wedding! 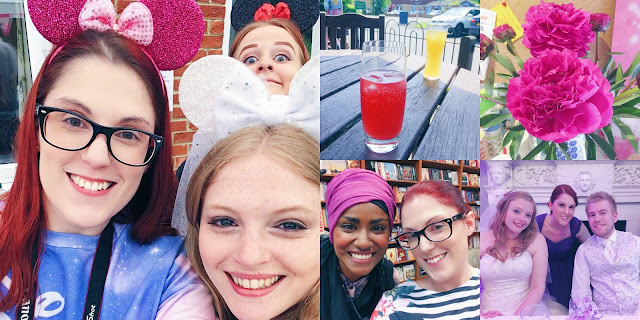 – I went to Maison Blanc with my friends, Ife, Shanae and Nina – My Mum and I went to the Festival Place Valentines Launch – And I took part in a TV News Day at Uni. 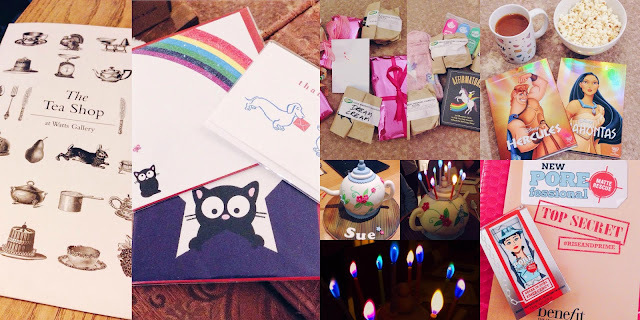 Also in February, I went to Watts Gallery with my friend Becky – I took part in a Secret Valentines swap – I added a couple more DVDs to my Disney collection – We celebrated my Mum’s birthday – And Benefit sent me a product to try out. 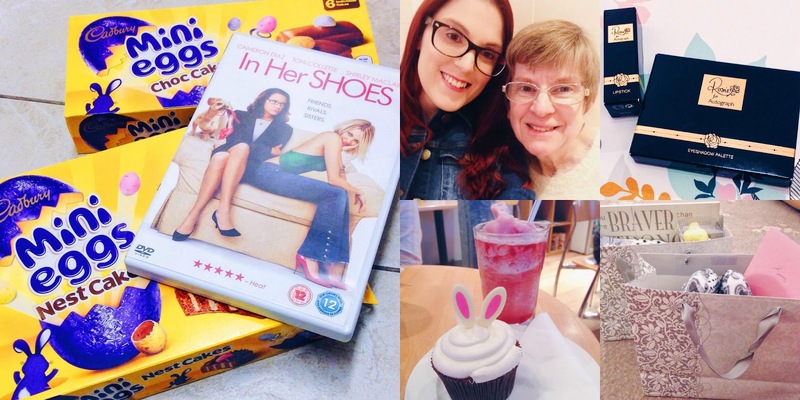 In March I had a movie day with my friend Becky – We celebrated Mother’s Day – I treated myself to some new make-up from the Rosie for Autograph range – I had an Easter Maison Blanc with Shanae and Tazmyn – And my friend Charlie, and her little girl, Izzi, surprised me with bags of presents! Also in March, my friend Katrina asked me to be her bridesmaid – I swapped Easter gifts with my friend Sarah – The dogs celebrated Easter – I received some lovely Easter goodies – I made Easter nests with my Mum – And I had an operation on my bladder. 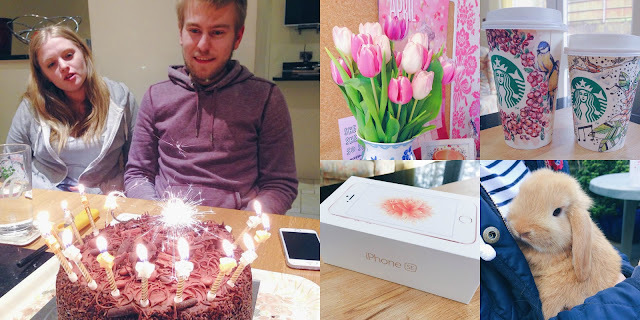 In April we celebrated David’s birthday (a little late!) – My asthma got worse so I was prescribed Ventolin (and treated myself to some beautiful tulips) – The Spring Starbucks cups came out – I bought myself a new rose gold iPhone SE – And Richard and Lisa welcomed Benjie into their lives. Also in April, I had a girly day with my Mum, Emma and Bekkah – My Mum and I went up to London for a Charlie and the Chocolate Factory themed afternoon tea – I met the girls from college for a drink – We celebrated my Grandma’s 90th birthday – We had a rather awesome cake for my Grandma – I finally had my catheter taken out (and received this postcard from my friend, Suzie). 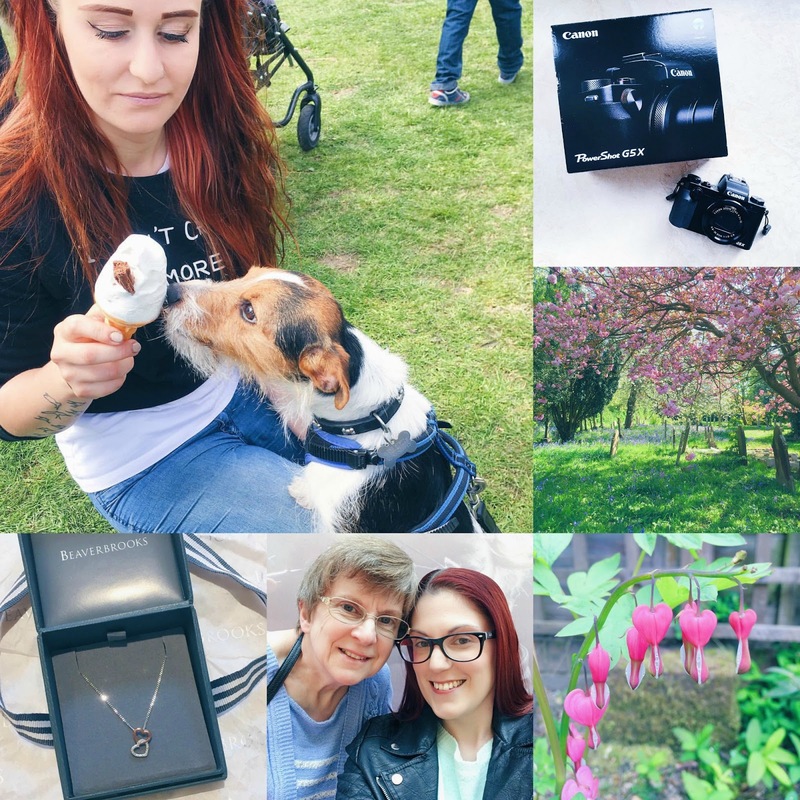 In May Freddie enjoyed a lick of ice cream at the May Fayre – I bought my new vlogging camera – I saw the beautiful blossom and bluebells at my local church – I was completely discharged from the mental health service (and my bleeding heart flowered) – My Mum and I went to the Festival Place Big Fashion Event – And I bought a necklace to remember my Gran. 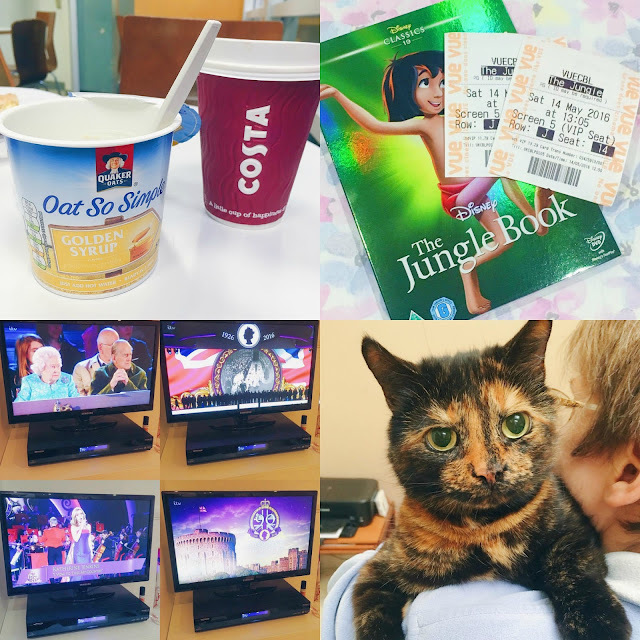 Also in May, I saw the arrhythmia nurses and started taking Midodrine for my POTS – I went to see The Jungle Book with my friend Becky – The Queen celebrated her 90th birthday with lots of events on TV – And Xena turned six! 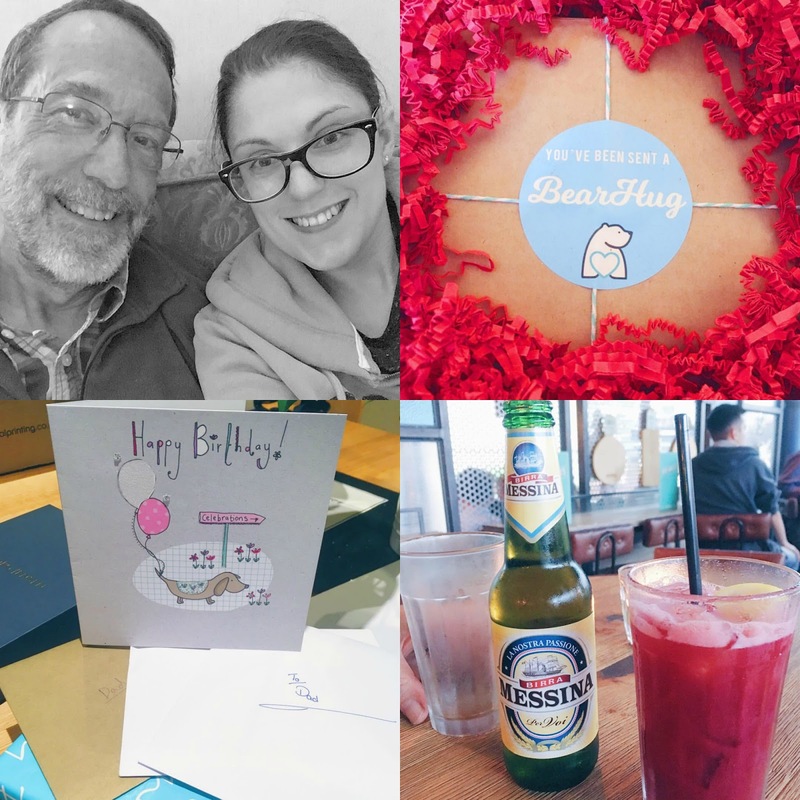 And finally in May, I became very ill after being prescribed Tapentadol, but thankfully Freddie was there to look after me – My friends, Helen and Sam, came over with a card from Helen’s little girl, Lexi – And we celebrated Rosiie’s birthday. In June we had Emma’s Disney Hen Do – I met my friend Lilli for a drink in the pub garden – I bought some pretty peonies – I was lucky enough to meet Nadiya Hussain from the Great British Bake Off – And I was a bridesmaid at David and Emma’s wedding. Also in June, we celebrated Father’s Day – I was sent a Bear Hug to review and voted in the EU Referendum – We celebrated my Dad’s birthday with a big family meal – And I had a mental health crisis, but managed to go and see Absolutely Fabulous at the cinema and have dinner with my Dad. In July I went to see The Secret Life of Pets with my friend Becky – We grew some beautiful flowers in our garden – The newspaper I helped with at Uni was printed – We had Lisa’s Hen Do Glamping in the New Forest – I treated myself to a Nutribullet – And I started playing Pokémon Go! 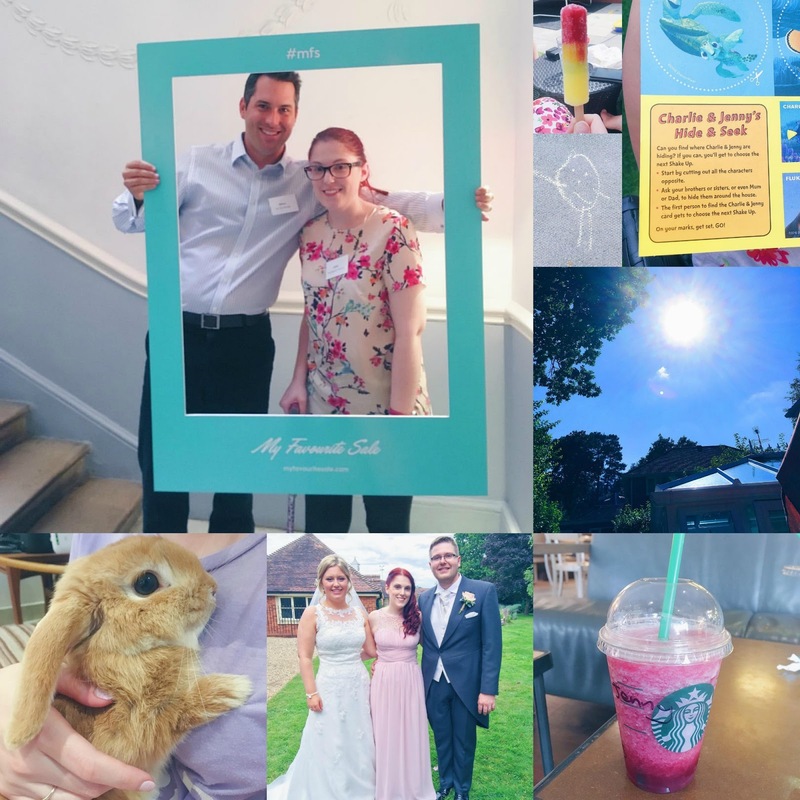 Also in July, I went to the My Favourite Sale launch blogger event in London – I had a sunny day in the garden with my friend Charlie and her two children, Izzi and Joe – We had a BBQ to celebrate Emma’s Dad’s 50th birthday – I went for a Starbucks with my friend Katrina – I was a bridesmaid at Richard and Lisa’s wedding – And Benjie came to stay with us while they went on their honeymoon. 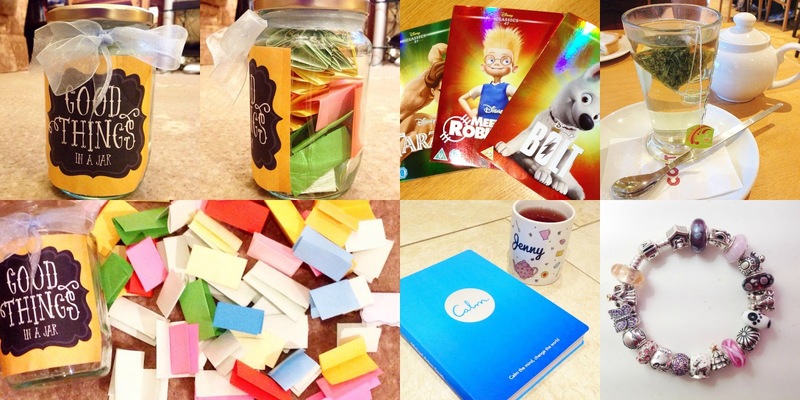 In August I had lots of cuddles with Benjie – I had a DVD and craft day with Emma and Bekkah – Jaffa was being cute as always and poking out his tongue – I went for a wedding dress fitting with my friend Katrina – I had a DVD day with my friend Becky – And I went for lunch with Katrina followed by seeing Finding Dory at the cinema. 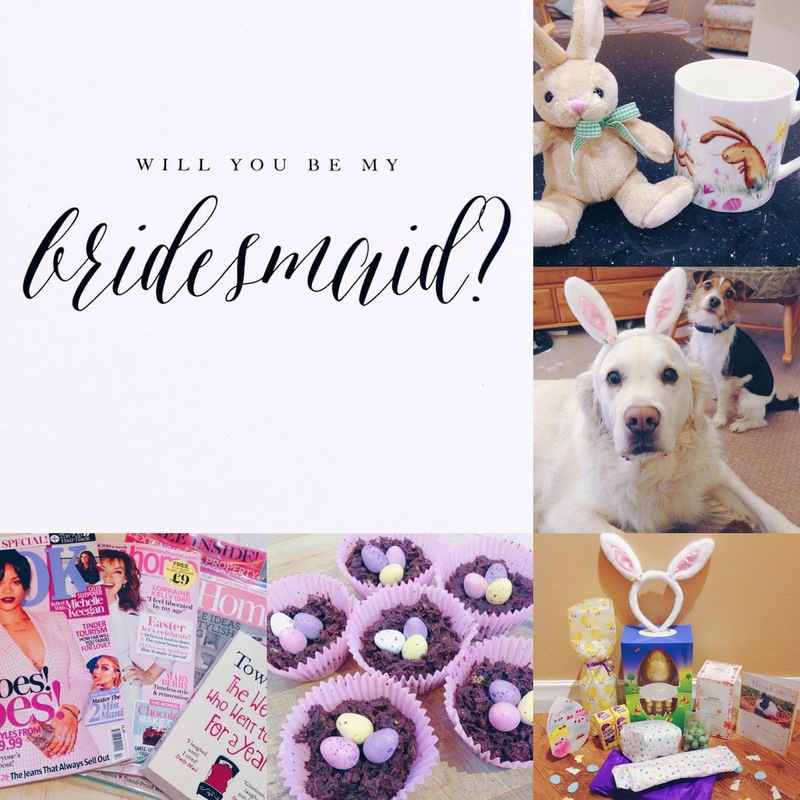 Also in August, I wrote about these cute cake toppers on my blog – I had a little baby shower with my friend Sarah (and baby Charlie arrived the following week!) 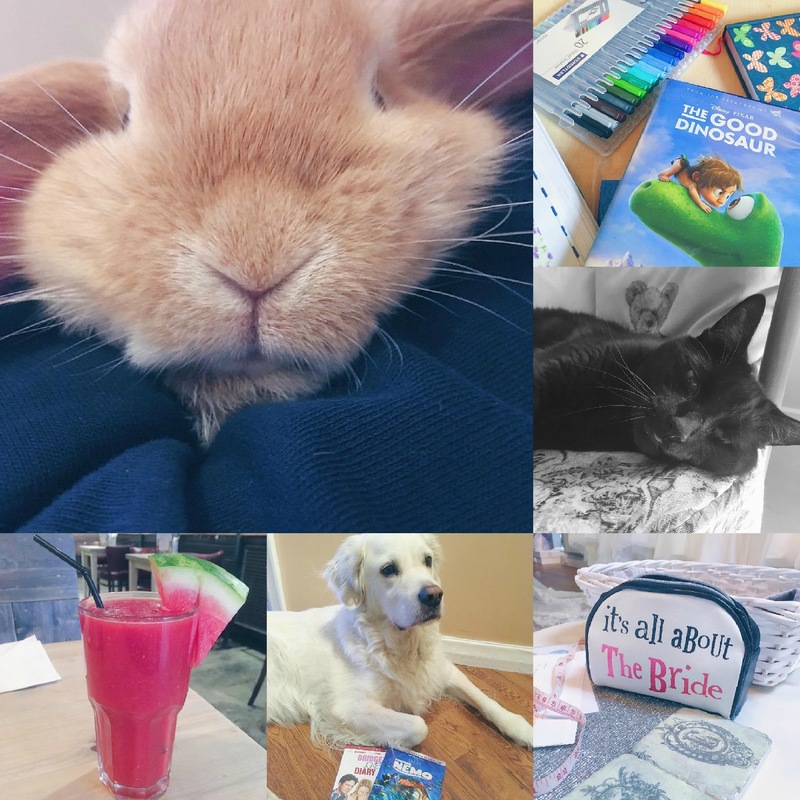 – I went for a Starbucks with my Mum – My Dad and I went to see The BFG and then went to Bill’s for lunch – I snapped this adorable photo of Bekkah with the dogs – And I went to the Sky Garden with my Mum, Richard and Lisa. 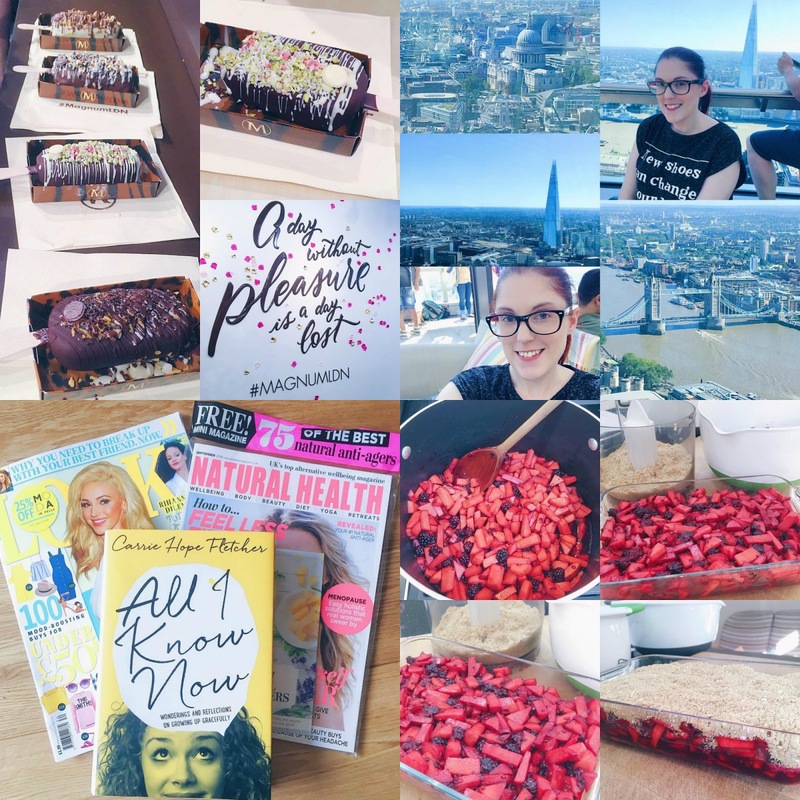 On the same day, we also went to the Magnum pop-up shop – I took some beautiful photos of the views over London – Later in the month I went for my Occipital Nerve block in hospital – And I baked a blackberry and apple crumble, which was very yummy! And finally in August, I visited Mayfield Lavender fields with my Mum, Dad and Emma – And I gave David and Emma, and Richard and Lisa, these gorgeous pictures of their wedding photos. 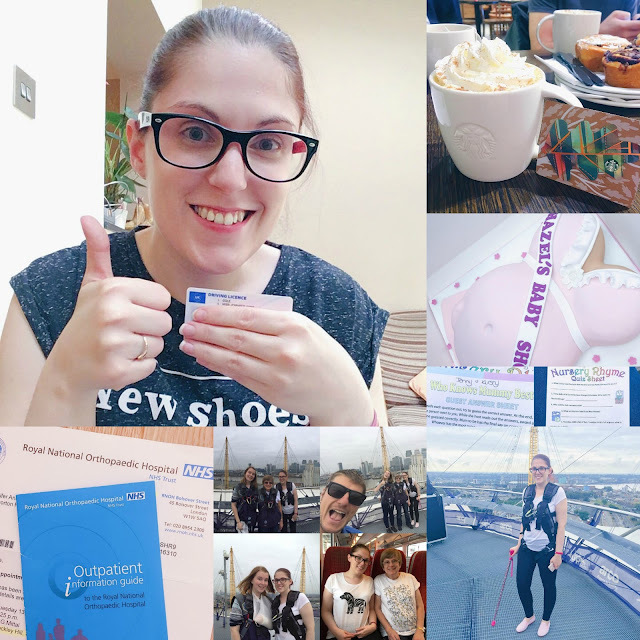 In September I finally got my driving licence after it was taken away because I had a seizure – I went to Starbucks with my friend Lilli and had a Pumpkin Spice Latté – I went to my friend Hazel’s baby shower – I did my sponsored wheelchair climb over The O2 in London with my Mum and Bekkah – Our guide was fantastic and had us laughing the whole way! 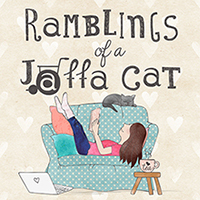 – And I had my first appointment at The Royal National Orthopaedic Hospital, Stanmore. Also in September, I went back to university for the start of my second year – I filmed a news story about National Cupcake Week (which, of course, meant getting some cakes!) 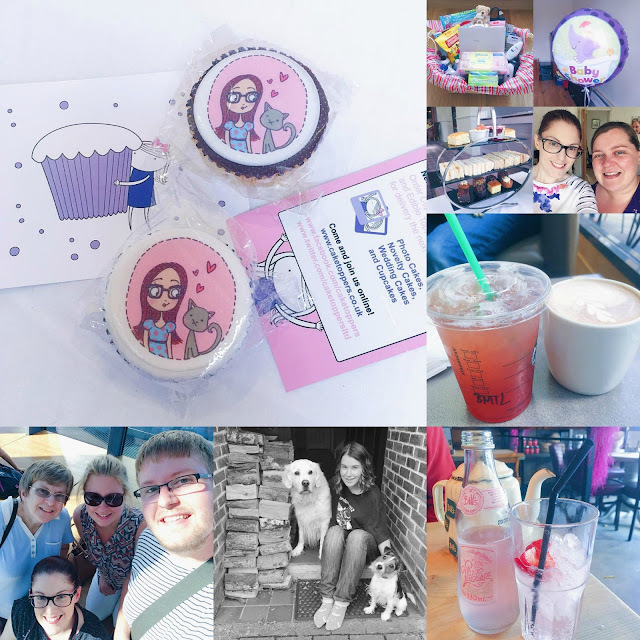 – I got to meet baby Charlie for the first time – I went to the Lush Spa in Kingston with Emma – And I went into hospital to have injections in my back. 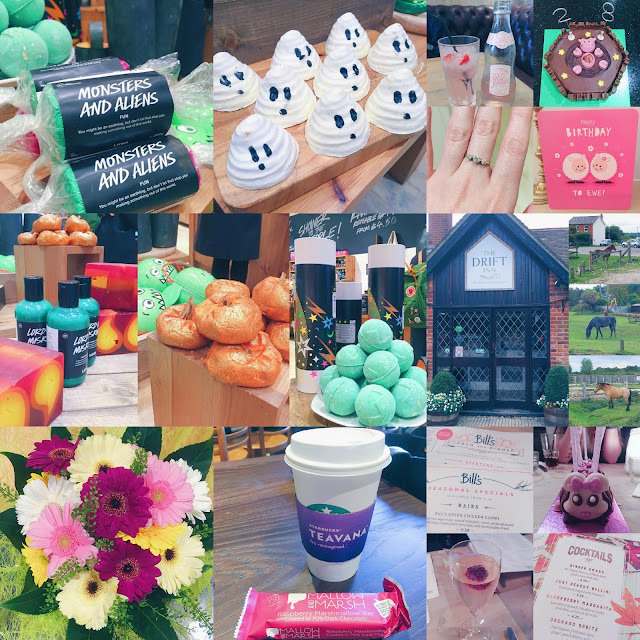 In October I organised and attended a Lush Blogger Event to see their new Autumn and Christmas range – I celebrated my 28th birthday by going to Bill’s with my Uni friends, having a pig in mud birthday cake and opening lovely cards and presents – I went to the New Forest with my Mum and Dad as a birthday treat – The whole family went for a meal at Bill’s to celebrate my birthday – I had a Starbucks with my friend Nina – And my Dad bought my Mum these beautiful flowers. 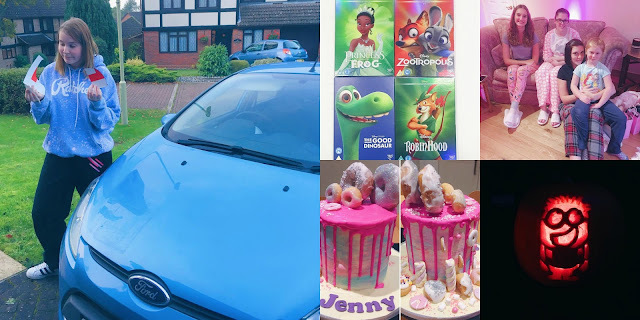 Also in October, Bekkah passed her driving test – I added four more DVDs to my Disney collection – I had a little pamper party with a couple of friends for my birthday – I had this amazing cake made for the party – And Bekkah and I carved a Minion pumpkin. 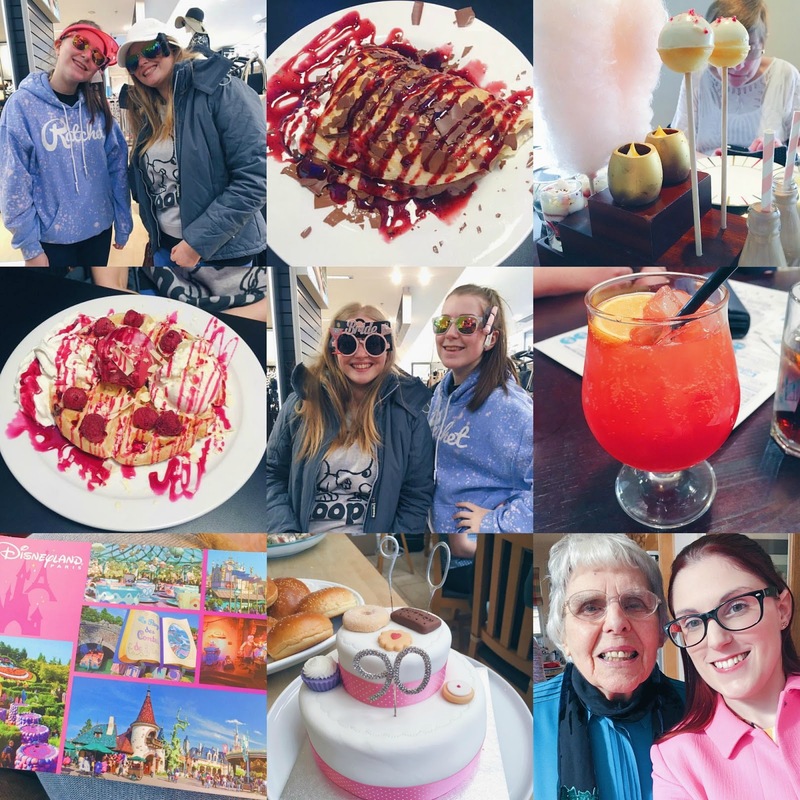 In November I went shopping with my Mum and we stopped off at Costa – I went to Bill’s for brunch with my friend Katrina – The leaves started to change colour – I had my rehab pre-assessment at Stanmore Hospital – And we celebrated Bonfire Night by watching the fireworks and having jacket potatoes. 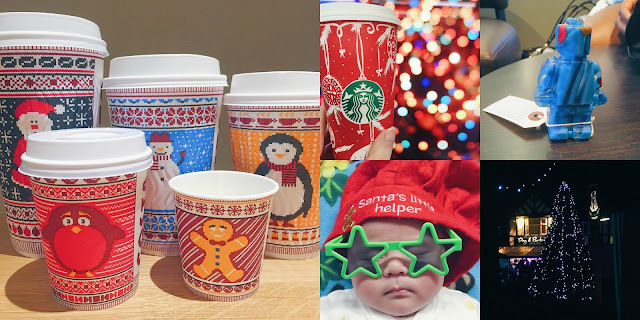 Also in November, the Costa Christmas cups were released – I had my first Christmas Starbucks – I met a lady called Hannah who makes these adorable Sweet Nothings, and she let me hide one in Farnham – My friend Sarah sent me this cute photo of baby Charlie at his sensory group – And I went to our local Christmas Market. In December I had a hospital appointment up in London, and got to see some of the Christmas lights afterwards – I got my advent calendar out again – I bought the dogs some reindeer antlers – I had a university trip to the Houses of Parliament – I had a lovely Christmassy afternoon with my friend Charlie and her two children Izzi and Joe – And I put my Christmas bedding on my bed. 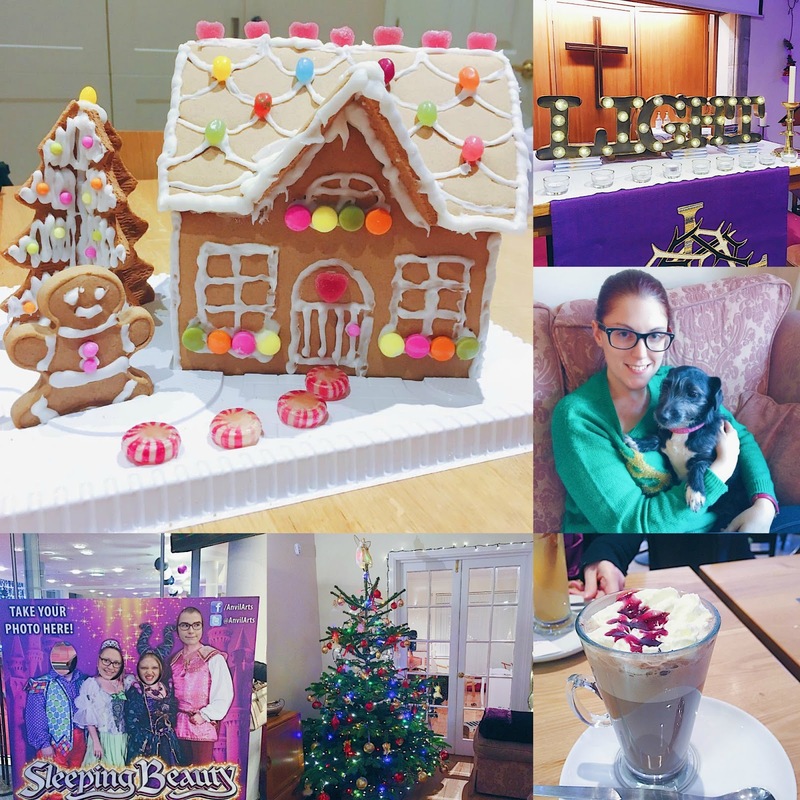 Also in December, I made a gingerbread house with Bekkah and her friend – I went to the Carols by Candlelight service at church – Polly the dog came to stay with us – I met my friend Lilli for a Christmas Costa – We put our Christmas tree up – And we had a family trip to the pantomime to see Sleeping Beauty. 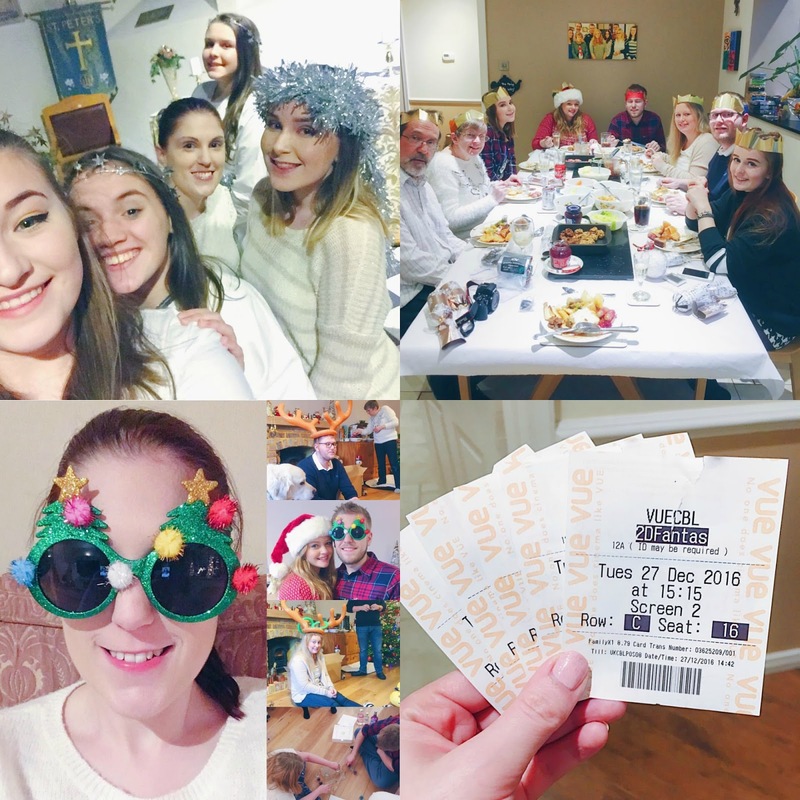 On Christmas Eve I was an angel at the church Crib Services – We had a lovely family Christmas lunch – On Christmas Day we took silly photos and played games as a family – And after Christmas I went to see Fantastic Beasts with my Dad, Richard, Lisa and Bekkah. 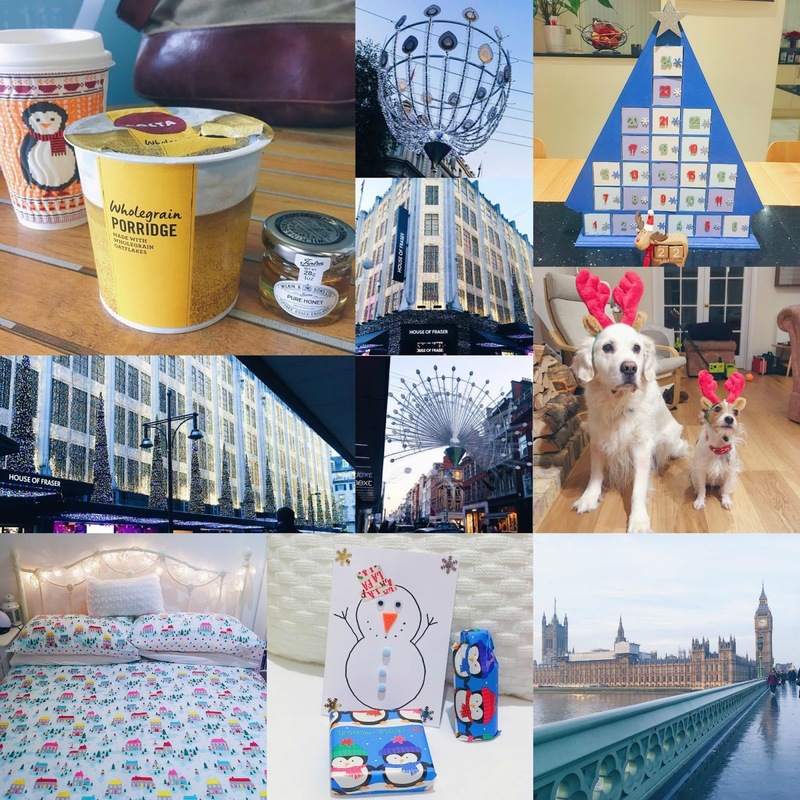 And finally in December, I helped Charlie celebrate his first Christmas – We had some family and friends round for games on New Year’s Eve – I took some silly selfies on New Year’s Eve using Snapchat filters. 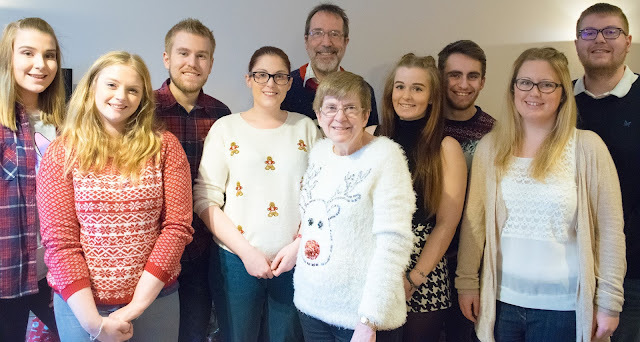 On Christmas Day we took our annual family photo. I love the way it grows a little bit each year! How was 2016 for you? I want to wish you all a very Happy and Healthy 2017!